Douglas Adams—friend, book scout, bibliophile, and collector of literary forgeries—is having a mighty fine lunch break. We can imagine a burger or burrito hastily consumed to leave plenty of time for a scouting stop. Priorities in order. After a quick smoke, he steps into a run-down antique store on Westheimer Avenue in Houston, Texas, for a look around. It’s hot as hell outside and inside isn’t much better. You sweat so much in the humid air you think you’ve just been swimming. The building is older than much of the material within: furniture, rugs, paintings, household items, and smaller knick-knacks. An item almost missed in an overflowing display case draws our intrepid book scout. Almost is the key word because Douglas misses very little while on the hunt, and he is always on the hunt. This display case yields a real beauty—a find so rare and marvelous that the book’s acquisition is the kind of story swapped among bookmen for years to come. But first it must be bought. There is no price and a helpful lady at the store, glad to see something go, quotes $50. Douglas is so excited he forgets to bargain. He has to tell somebody and I’m lucky enough to get a phone call shortly afterwards. “I just found something really good,” he says. There is a pause on my end as my mind kicks into high gear (I can hear my wife laughing while reading that). Early directories of major cities are highly sought-after and normally expensive. They’re also rare because they were thrown away over the years like old phone books. The information found within such directories—people, businesses, the advertisements, etc.—is all primary source material for historians and the curious. In this instance, the book itself is a treasured relic from the embryonic beginnings of a burgeoning metropolis now over two million strong. He ungraciously turns down my offer and emphasizes the rejection with a colorful expletive. “Okay,” I say, “Let’s get serious. I’ll do some research on my end and you do the same and let’s talk tonight.” Douglas and I have a symbiotic book relationship so I’m always willing to participate in such ventures. I then imagine him lead-footing his car back to his office, one eye on the road and one eye on his new book baby. I immediately set aside my real estate work to investigate this gem. Priorities in order. A fuller description: W. A Leonard, compiler. 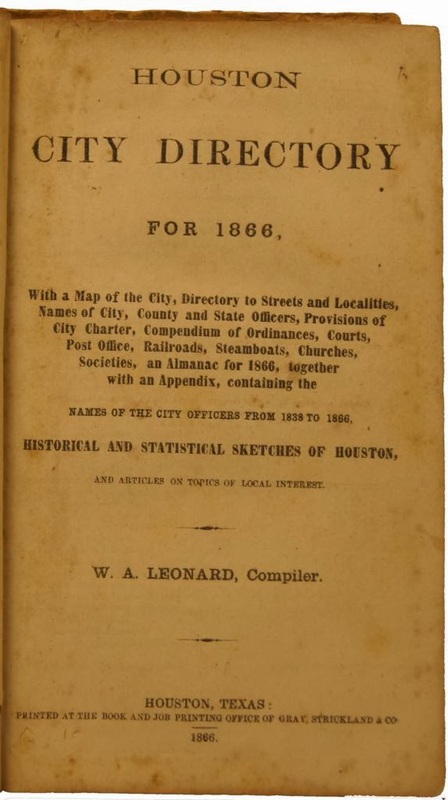 Houston City Directory for 1866, with a Map of the City, Directory to Streets and Localities, Names of City, County and State Officers, Provisions of City Charter, Compendium of Ordinances, Courts, Post Office, Railroads, Steamboats, Churches, Societies, and Almanac for 1866, together with an Appendix, containing the Names of the City Officers from 1838 to 1866, Historical and Statistical Sketches of Houston, and Articles on Topics of Local Interest. Houston, Texas: Gray, Strickland & Co., 1866. My preliminary research locates only six surviving copies in libraries (at least one lacking the map). I find no copies offered for sale in the trade or at auction in the last thirty plus years. Douglas confirmed my findings in his own investigation. The book is indeed, muy raro. “Sell it or keep it?” I ask later that evening over the phone. “I want to sell it,” he says. No surprise there. Douglas isn’t trying to form a rare Texana collection himself. He would like to find it a good home and pad his book account. Douglas has enough dealer in him to not get too attached. I am, on the other hand, a highly distilled collector by nature and most of my stuff, even the few miscellaneous high-spots worth ready cash, remains classified as “long-term” investments. I’ve made a few exceptions over the years but this is usually to fund another book purchase more specific to my interests. “I’ve got a few ideas for buyers,” I say. My background in appraisals and the book trade often provides a base of potential clients for high-end items. “What do you think it’s worth?” he asks. “After speaking with…. the director of our Texana department, and looking at the comparables you included, it is very likely that the value of the directory is significant. However, since the piece has no track record at auction, and considering the condition it is in at present, it would not be advisable to place an estimate like $4000-6000 on it. 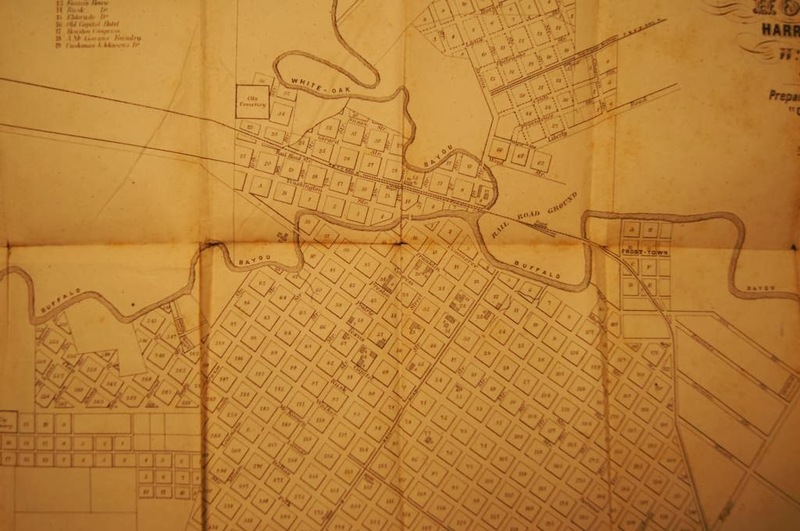 The torn portion of the map would have to be restored at no small cost in order to re-attach the portion still bound in the book, and the boards would have to be re-attached, as well. These facts will affect how bidders react to the book, once it is in a catalog and up for sale. “Also, some of the comps that you cited, including the Dallas directories and the Dallas map [published much later], were estimated in the low hundreds of dollars, based on their own lack of auction history, and then did way over expectations at the auctions. The San Francisco directory was estimated at $1000-1500, then sold for just over $3000 [although Dorothy Sloan sold in 2005 the first San Francisco directory for $9750 on a 5000/10,000 estimate]. This is, of course, how we like to see items sell: estimate low (especially when you don’t have a track record) and sell high. There are quite a number of comments that could be made about the above but two are significant for our story. The first is suggesting an estimate of $1,000-1,500 and starting the bidding at $500, a ridiculously low sum, even for a “soft” estimate. That is putting a huge risk on a seller and any knowledgeable owner is going to head elsewhere. The second is the comment about the book’s condition. The original illustrated boards are detached from the fragile cloth spine but that is a relatively easy fix. The folded map is torn loose from the mount and would require a bit more surgery but nothing hugely complicated or expensive. I discuss with Douglas whether to put a few hundred dollars into conservation to enhance appearances but he decides any new owner would probably want to have their own work done, so the matter is left there. Along with the auction house inquiry, I suggest Douglas contact Bill Allison, recently retired Houston attorney, and collector turned dealer. Bill is a friend of mine and a most enjoyable bookman to spend an afternoon with. Bill has expertise in various areas of Texana and Western Americana. Bill appreciates the item but it is a little far afield of his specialties. However, he does approach fellow Houstonian Robert Cochran on Douglas’s behalf. Cochran is another formidable Texana collector who livens up any meeting with a plethora of good book stories. Cochran decides he is not interested in the book so we are momentarily at an impasse. Douglas contacts J. P. Bryan’s curator and she asks that he bring the directory in for examination. I go with him. We enter the reception area of Torch Energy that is filled with diverse items ranging from western-themed Andy Warhol prints, a 19th-century Spanish saddle, historic swords, and paintings of early Texas luminaries. We are disappointed to not meet with J. P. Bryan directly. However, after a brief visit, Douglas agrees to leave the directory for him to look at and quotes the curator a price that was not overly aggressive but fair based on our research. The surprise of the visit is an extensive backstage tour of the collection by the assistant curator, Andrew Gustafson. Andrew is young, energetic, and historically minded--well-suited for the position. We receive a glimpse of the vault where the shelves of rare books and manuscripts are housed. Nearing the end of our tour J. P. Bryan fortuitously enters the office. He is officially retired, Andrew later informs us, but Bryan still often frequents the office and collection. We exchange greetings. Bryan is a friendly man, slightly built, quick of step and mind. He poker-faces the information that the first Houston directory with map is in the house, so to speak, but I notice he wastes little time heading back to look at it. A short time later on our tour we meet him again briefly in a hallway. Bryan is pre-occupied with other visitors but he confirms his interest in the book and says he’ll have a decision for Douglas after the weekend on Monday (we were there on Friday). I ask him if he’s seen any other copies for sale over the years. His reply is factually shaky and tends to downplay the rarity of the item. He is in fact bullshitting us a bit but there is no need to call him on it. We are collectors, too, and understand the instinctive reaction. “He wants it,” we both say in unison as we step into the elevator. Bryan shares the same biblio-disease and the symptoms are obvious to fellow sufferers. Bryan did not contact Douglas on Monday with a response as promised. A few more days go by and still no word so Douglas politely emails the curator a reminder. Finally, a low-ball offer from Bryan via return email. The real game has begun. Douglas’s asking price is fair but he comes off a little in his counter and more days go by without word. Douglas becomes irritated, which takes some doing, and through a connection at his own work another viable buyer surfaces—a well-heeled Houstonian with a historical bent. Bryan is about to lose the book and Douglas doesn’t feel bad about it. “I’m going over to pick it up today,” Douglas tells me almost two weeks since we had originally dropped it off at Bryan’s office. “He had his chance.” I reply. What a huge mistake on Bryan’s part I think to myself. One of the rarest pieces of Houston history with the map and he lets it go! I am befuddled and it appears Bryan has been over-confident in his dealings. Oh well, collectors always remember the ones that get away the most. I am contemplating the situation when a few minutes later Douglas calls back. Douglas and I didn’t need to talk further at that moment, we just laughed. Game back on. “You know what to do. Call me back,” I reply. “Congratulations,” I say, and we banter a bit more, excitedly, before hanging up. A few minutes later I put aside work and step outside my house, sun shining violently and heat still cooking any living thing like a microwave, but it feels good for a little while, and I enjoy the moment, gazing absent-mindedly at the sharp blue sky, while I soak in my vicarious participation in this horse tradin’ contest between Douglas and the mighty collector J. P. Bryan. Priorities in order. this is a great tale, well told , and congratulations on your find! That's my boy! Douglas never fails to amaze me! Really well written....enjoyed very much....happy for Douglas! Great story, well told! I am dumbfounded by the initial response from the auction house though on further reflection, I guess I shouldn't be. It is symptomatic of a greater societal trend to rely on quick and easy answers and when none are forthcoming, shrug your shoulders and move on, washing your hands of the troublesome outlier. The kind of detective work you guys did is a joy for any book person... recognizing significance and then doing the research, searching for comparables... just thinking about it gets my biblio-detective blood flowing. Good stuff! Nice visiting with you guys at the Houston Book Fair this weekend--Kurt and Douglas. Great find, great story!